The city of Amsterdam is situated on the river Amstel. The first settlers were fishermen and farm workers, who settled along its banks. Frequent floods had forced local residents to build canals, dams and dikes to protect their homes from the water. The soil in that area was swampy, so all the buildings were built on piles, sunk deeply within the soil. The first dam in Dutch was called Aemstelredamme, which translates as ‘the dam on the Amstel’. That is how the famous Dam Square and the city itself got its names. The city is permeated with a large number of canals, that’s why it received the second name “Venice of the North". The basis of the economic and cultural development of Amsterdam was seaborne trade. 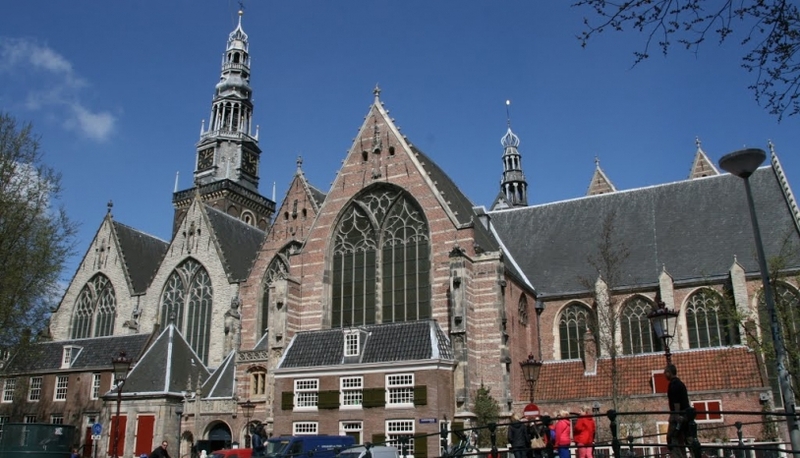 At the beginning of the XIV century Amsterdam became a city. Trade relations with the neighboring cities were gradually developing. XV century had not passed unnoticed for the city. While Amsterdam was the largest shopping center in Europe, and continued to develop and strengthen trade ties, the wooden buildings of houses and streets were enveloped in flames twice. After the second fire, that broke out in 1452, only one-fourth of the city's buildings survived. Later, people began to build their houses out of stone. In the 16th century, the Netherlands bourgeois revolution for the liberation from the impact of Spain lasted for 80 years, since 1568 to 1648. At first sight the war threatened the trade development, but in fact the opposite happened. After the war, in the early 17th century, Amsterdam gained new product markets and population growth. It had been the beginning of the "golden age", which was characterized by considerable intellectual, commercial and cultural growth. During World War II, German invaders occupied Amsterdam. Before the war, near 140 000 Jews had lived in the city, after the Germans left the city, there were only 40 of them. Currently, the native population of the city is about 40% of the total population. There are connected different nationalities and religions. Amsterdam gets a considerable profit out of tourism. Every year it is visited by about 4.5 million tourists, who are attracted with loose morals, magnificent architecture, historical monuments and museums. 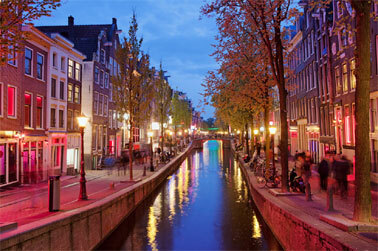 Perhaps, the most famous place in Amsterdam, that interests the travelers all over the world, is Red Light District. The history of its origin dates back to the 12th century, when sailors, arriving at the ports of Amsterdam, after a long journey, looked for an entertainment with women. To avoid confusion, in the houses, arranged for the pleasures of love, the red lantern was lit. Women stood at the doors and windows of the houses, calling men. From there came the name “Red Light District". A lot has changed over time, there have been periods, when the brothels were working illegally. Only in 2000, the right to legalize the work of these institutions was transferred to the city authorities. Now the Red Light District is a very lively place, where about 1,000 prostitutes legally works. Women undergo regular medical checks and pay income taxes.